Most magazines are pretty mainstream in their tastes. They like stories with plain, rather than poetic language; they prefer domestic, rather than exotic settings; they tend toward subjective points of view; and they like stories that focus on character or, sometimes, plot. But Post Road seems to have a different focus. The work here isn’t exactly experimental, but it is innovative with a humorous slant. And that’s an important aspect to note. For example, there is the story “Victor” by Michael Czyzniejewski (who is editor of Mid-American Review), about a ventriloquist’s dummy who comes home with the narrator’s wife. There are serious issues that the dummy raises, but the concept is not, um, realistic. “Bennett’s Cheap Catharsis” by Evan Lavender-Smith (editor of Noemi Press) is structured as a fictional essay by a deceased author, in response to an essay by another deceased author. In “O Saddam!” by Rusty Barnes (editor of Night Train—do you detect a pattern here? ), it turns out that the whole time U.S. forces were hunting Saddam Hussein he was selling hot nuts in Boston. “Possum” by Mary Morris—not an editor, as far as I can tell—isn’t as far-fetched, but it is funny (with a serious twist). 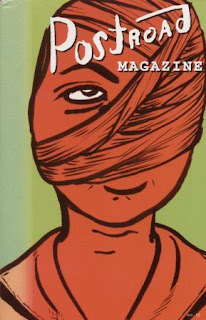 There are also several essays in this issue and a few flash fiction pieces that are somewhat confusingly called poetry—I suppose the editors consider them prose poems—plus an interview with Phillip Lopate. One other innovative feature of the magazine is the “Recommendations” section, in which authors such as Jill McCorkle, John D’Agata, Quinn Dalton, and Debra Spark discuss favorite books. These aren’t reviews—in a way, they’re better.